A new study on social media engagement has found that highly engaging posts have the greatest impact on consumer spending. Published in the Journal of Marketing, this study sheds light on the importance of strong engagement in social media marketing campaigns. Researchers combed through data from several large retailers, all of whom had multiple locations within the United States. For the study, researchers specifically looked at customer engagement data on the retailers' social media pages, cross-referencing it to retailers' in-store purchases. The researchers found that social media posts with the highest level of engagement (e.g. 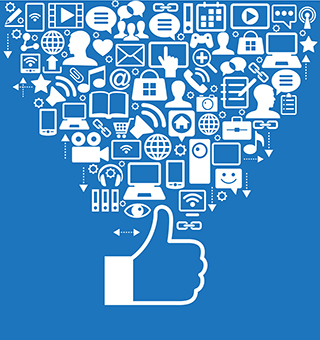 Likes, comments and shares) had the greatest impact on consumer spending. Retailers that published highly engaging posts on social media reaped the benefits of more in-store sales. Furthermore, the researchers also discovered that highly engaging posts on social media improved the effect of traditional TV and email marketing campaigns. For example, when social media is combined with TV advertising, spending increased by 1.03%, and cross-promoting sales increased by 0.84%. Those may not be huge increases, but for large retailers those percentage points can equal big bucks. "A neutral or even negative social media post with high engagement will impact sales more than a positive post that draws no likes, comments, or shares. This is true even among customers who say their purchase decisions are not swayed by what they read on social media." Whether you're a national retailer or a small business owner, you should focus your social media marketing efforts around user engagement. Just because you post something on social media doesn't necessarily mean that your target audience will see it, nor does it mean that it will have any impact whatsoever on their spending habits. But you can always tell if your social media content is a success by looking at user engagement. Are users liking and commenting on your content? If so, it's a sign that your content is a hit, and engagement such as this typically translates into more sales, according to these results.